So, today is Memorial Day 2010. We will, en masse, head to our grills and coolers. Some of us will stay home; many will head to a family reunion. We will be with friends and family. I think you would find more ribs and hamburgers consumed today than any other day of the year. Oceans of soft drinks and beer will help us celebrate this day. Dear Reader, why and for what are you celebrating? You get an extra day off, maybe with pay? You get to sleep in? Maybe you spent Saturday doing all your yard work so you could have this day to play. Yes, you will have a great day and I am glad for you. But…. That’s one million, three hundred and three thousand, six hundred and ninety six men and women who have died fighting our country’s wars. It is not an exact number. This day is for them. I visited a Civil War battleground last year and wrote about it at the time. The original story is posted as follows and is my tribute to 1,303,696 patriots. We visited this battlefield not long ago. It is just outside Murfreesboro, Tennessee. As most Civil War sites are, it is quiet and well cared for. In the serenity of the fields, it is hard to imagine the carnage that took place here 145 years ago. You really don’t. At least, not until you see the National Cemetery. There are 6,162 graves there. 2,100 some odd were never identified (“known but to God” as the military is fond of saying). 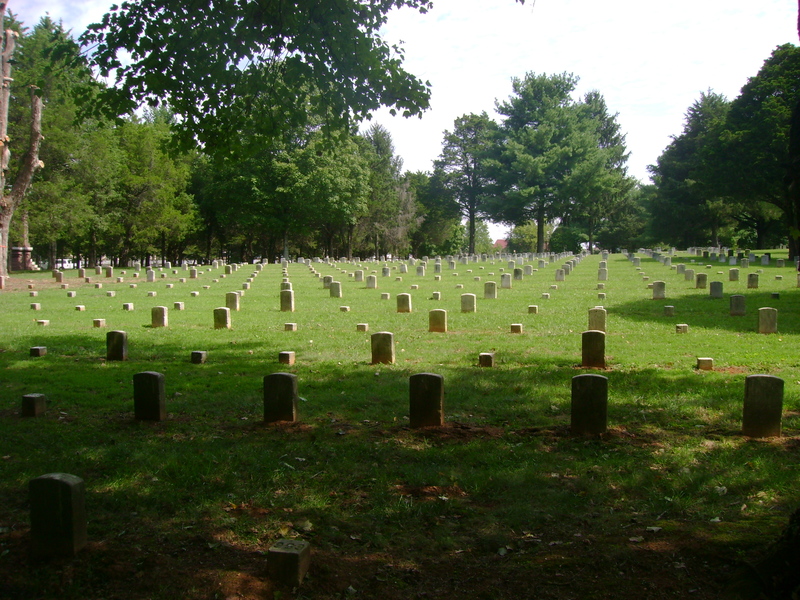 Most of the graves are for Union soldiers who died in that horrific three-day battle. It is deservedly a quiet and reverent place. This is the place where the term “hell’s half acre” was coined. One is moved to reverent silence. It is a long poem (you can read it at http://www.cem.va.gov/cem/hist/BODpoem.asp). When I get to the end, I am further moved and choked up. These men died for an ideal. They died for you and me. They died for freedom. I am shocked and saddened at the memory of this place but very glad our nation has made it a scene of peace and solitude. As we left, I let my family go ahead to the car. In silence and near tears, I turn to face the graves of these men. The only appropriate response was a silent, slow salute. They each had their own story. Each had their own way of dealing with those awful three days. They were one man. Imagine. Well, I am the stick in the mud that really does not like snow and cold weather all that much. Anybody who spent any time in the Army will no doubt share that same dislike. In its infinite wisdom, the Army has a tendency towards having it major training exercises in the winter. The stated theory is the frozen ground will sustain less damage from the heavy equipment that the Army likes to run around in. Anytime the Army tears somebody’s ground up they have to pay for repair. That’s why they have their own ground on various installations nationwide so it can tear it up at will and nobody really cares all that much. But, even on their own ground, America’s oldest institution still loves to play out in the snow and really cold weather. Having spent I think half of my 22 year career in uniform in snow and winter conditions, I’m kind of tired of it. I’ve lived in it, slept in it, cooked with it, melted and drank some of it, and did stuff I care not to admit to with it. Never bathed in it though (The German Army of WWII was taught to bath with the stuff – can’t make this up – I have pictures). So, why do you care? Well, consider this: the winter of 1944 was the coldest winter on record in Europe. During WWII, a couple hundred American soldiers got surrounded in a town called Bastogne in Belgium. They were ill-equipped in every way to face the vastly stronger German army that surrounded them. No winter clothing, no hot food, very little ammunition, and virtually no medical supplies. They lived in those deplorable conditions, while under attack, for about a month. They persevered until US forces could get through German lines to relieve them. The weather they endured was brutally colder than anything I’ve ever seen. They withstood a horrendous onslaught in brutally cold conditions. I doubt they like the winter much either. Some distance away at periscope depth, the Captain of the German U-boat, U-223, spots the convoy. She approaches the convoy on the surface and, at his order, lays out a fan of three torpedoes. Two apparently went awry. The third, the third slammed amidships into Dorchester’s starboard side. It is a mortal wound. Boiler power was lost so the whistle to abandon ship could not be sounded. Electric power was also lost so that an SOS could not be sent. Several life boats were destroyed. Many of the ones that did launch capsized due to overcrowding. In the confusion, life jackets were lost. They were of little use to the hundreds of men thrown violently into 34 degree water. The water was so cold they were unable to even grasp the cargo nets thrown to them. 904 men went into the cold northern Atlantic that night – 230 would survive to see the sunrise – and Dorchester sank by the bow in 20 minutes. The explosion had left many men badly wounded and unable to move. Four young men however made a choice to give up their life jackets and stay on board with the wounded. They were all young Army Chaplains. They stayed on board to preach courage to the living and pray with the dying. They recognized that the needs of those all around them were more important than their own. Survivors tell of them moving about the sinking ship tending to as many as they could until Dorchester finally sank into the cold and dark north Atlantic. It is said they were last observed standing on the deck together, arms linked, praying loud enough to be heard in one final effort to bring comfort to those who would soon face a cold and lonely death. For their actions, the four chaplains were posthumously awarded the Distinguished Service Cross.—- Today, the US Army trains its Chaplains at Carlisle Barracks in Pennsylvania. There is a Chapel there with a stained glass window installed in memory of those four Americans who showed the greatest love that they gave their lives for their friends.